Arepas are a South American staple, made from lightly griddled cakes of ground maize dough, or, a finer form of corn flour, mixed with water and salt; sometimes it’s mixed with butter and milk. Since the maize flour is already cooked, the cakes are formed easily, forming a light, spongy dough. The cakes are usually filled with meats (shredded beef, chicken or ham), cheese, vegetables, and/or beans. I ordered mine with shredded beef and black beans, with a side of verde sauce. The arepa was freshly grilled to order. As I was waiting, I was distracted by the coffee/cappachino machines against the wall (God, I wish I were a coffee-drinker right then…), and the shy 16-year-old cashier fresh from Uruguay. Turns out, the cashier didn’t know how to count out the correct change; his English was nonexistent (I wish I knew Spanish!) and he was new to the States. I tried to help him make change; my maternal instincts took over, and I felt protective of the boy. The owner, a lovely woman from Venezuela (where arepas are originated), came to the rescue as the cashier tried to count out change from my $20 for a $8.08 order. She was busy griddling the cakes during the exchange, and giggled and clucked to the boy as a mother would. At the same time, another customer ordered in fire-fast Spanish; she had full, hot pink lips, bleach-blond locks and firy brown eyes. As got my food, I asked where they were from. “Sounds like we have quite the trifecta here,” I commented, as they laughed. 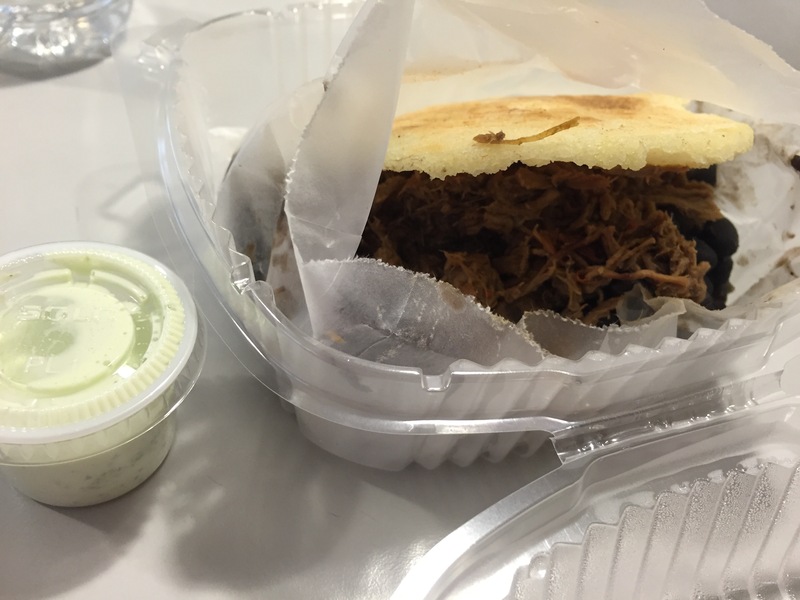 Back to the food: Arepas are fabulous! The maize dough cakes are light, and spongy like a pita, but more airy, and the corn-based flour creates a subtle corn flavor, unlike Mesa flour, which makes tortillas. The shredded beef was good and tender, with robust spices and tomato bits. The black beans accompanied the arepa/beef combo very well. I only wish that I had ordered the spicer sauce, rather than the verde.